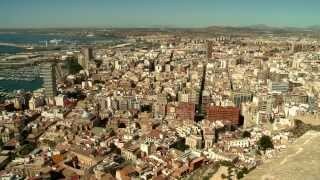 N 38° 20' 42" and W -0° 28' 53"
Alicante in Alicante (Valencia) with it's 334,757 habitants is a town located in Spain about 224 mi (or 360 km) south-east of Madrid, the country's capital town. Time in Alicante is now 11:25 AM (Friday). The local timezone is named Europe / Madrid with an UTC offset of 2 hours. We know of 8 airports closer to Alicante, of which one is a larger airport. The closest airport in Spain is Alicante International Airport in a distance of 6 mi (or 10 km), South-West. Besides the airports, there are other travel options available (check left side). There are several Unesco world heritage sites nearby. The closest heritage site in Spain is Palmeral of Elche in a distance of 65 mi (or 105 km), East. We saw 7 points of interest near this location. In need of a room? We compiled a list of available hotels close to the map centre further down the page. Since you are here already, you might want to pay a visit to some of the following locations: Busot, Santa Pola, Agost, Aiguees and Tibi. To further explore this place, just scroll down and browse the available info. Let's start with some photos from the area. 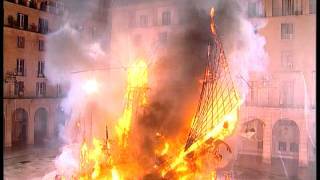 Cuarta Mascletà del concurso oficial de las Hogueras de San Juan 2014. 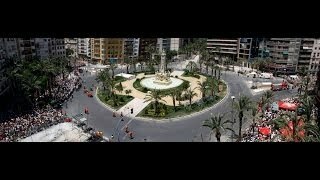 Desde la plaza de los Luceros en Alicante. Pirotecnia Martí S.L..
Buen dia de ruta con unos grandes =D. 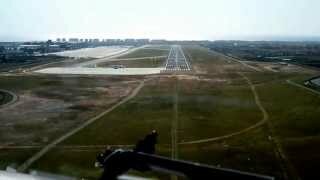 Edinburgh - Alicante, B737-800 Landing. Captains landing not mine. 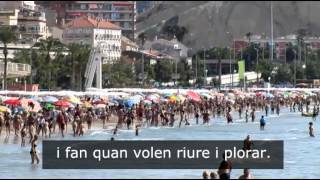 Sant Joan d'Alacant is a municipality belonging to Alicante metropolitan area, in the southeast of Valencian Community, Spain. It is the geographic center of the Old Garden of Alicante. Its limits are with the settled areas of Alicante (7 km), Mutxamel (1 km) and El Campello (3 km). It is within the Alicante metropolitan area and shares the same fire department and metro services. Located at 38.4014, -0.436667 (Lat. / Lng. ), about 5 miles away. Costa Blanca refers to over 200 kilometres of Mediterranean coastline in the Alicante province of Spain. The name "Costa Blanca" was devised as a promotional name used by BEA when they launched their air service (for £38.16s. -) between London and Valencia in 1957. It has a well-developed tourism industry and is a popular destination for British and German tourists. Located at 38.354, -0.408 (Lat. / Lng. ), about 4 miles away. 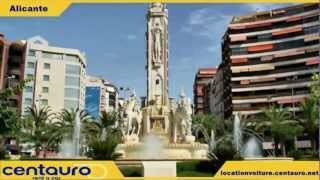 The Alicante Metropolitan TRAM operates in the Spanish city of Alicante and its surrounding area and. Like other narrow gauge railways in the Valencian Community, it is run by Ferrocarrils de la Generalitat Valenciana (FGV). It was inaugurated on 15 August 2003 replacing narrow-gauge diesel trains between Alicante and El Campello. Located at 38.3653, -0.444444 (Lat. / Lng. ), about 2 miles away. Estadio José Rico Pérez is a multi-purpose stadium in Alicante, Spain. It is currently used mostly for football matches, being home to Hércules CF. It also held World Cup matches when Spain organized the event in 1982. The stadium can hold up to 30,000 people. It was built in 1974, and is situated 2 miles outside Alicante city centre. Located at 38.3572, -0.4925 (Lat. / Lng. ), about 1 miles away. The Archaeological Museum of Alicante (Spanish: Museo Arqueológico Provincial de Alicante, Valencian: Museu Arqueològic Provincial d'Alacant, abbreviated as MARQ) is an archaeological museum in Alicante, Spain. The museum won the European Museum of the Year Award in 2004, a few years after significant expansion and reallocation to renovated buildings of the antique hospital of San Juan de Dios. Located at 38.3537, -0.476389 (Lat. / Lng. ), about 1 miles away. Alacantí is a comarca in the Valencian Community, Spain. It is bordered by the comarques of Marina Baixa and Alcoià to the north and Baix Vinalopó to the south. Located at 38.3461, -0.484722 (Lat. / Lng. ), about 0 miles away. Centro de Tecnificacion de Alicante is an arena, designed by Enric Miralles, in Alicante, Spain. The arena holds 5,425 people. It is primarily used for basketball and the home arena of CB Lucentum Alicante. Bob Dylan performed at the arena during his 2008 European Tour on July 2, 2008. Located at 38.354, -0.494583 (Lat. / Lng. ), about 1 miles away. 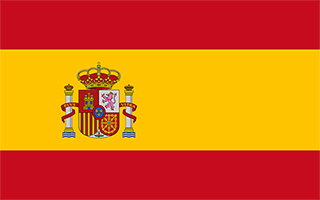 The N-330 is a highway in Aragon, Spain. It forms part of European Route E7. It connects with France at the Tunnel of Somport (12 km) with Huesca. It then becomes the Autovía A-23 to Zaragoza. It heads south to Daroca, where it becomes the N-234. The road emerges again south of Teruel following the Rio Turia. The N-420 branches west in the Rincón de Valencia rising to over 1,000m. 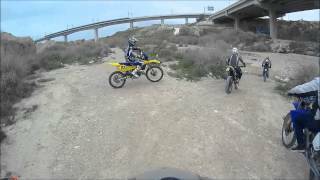 It then runs south to Utiel and the Autovía A-3 in the province of Valencia. Located at 38.3411, -0.549167 (Lat. / Lng. ), about 4 miles away. The Autovía A-31 is a highway in Spain. The road connects Madrid to Alicante. It starts at a junction with the Autovía A-3 at Alarcón and heads south east to Albacete. Thereafter the Autovía A-30 branches off to Murcia. The A-31 heads east to Almansa and a junction with the Autovía A-35 before heading to the coast the Autovía A-7 and Alicante. Located at 38.3347, -0.510556 (Lat. / Lng. ), about 2 miles away. The University of Alicante was established in 1979 on the basis of the Center for University Studies (CEU), which was founded in 1968. The University main campus is located in San Vicente del Raspeig/Sant Vicent del Raspeig, bordering the city of Alicante to the north. As of 2010/11 academic year, there are approximately 27,000 students studying there. Located at 38.3846, -0.513147 (Lat. / Lng. ), about 3 miles away. Santa Bárbara Castle (Valencian: Castell de Santa Bàrbara, Spanish: Castillo de Santa Bárbara) is a fortification in the centre of Alicante, Spain. It stands on the Mount Benacantil (166 m). Located at 38.349, -0.478 (Lat. / Lng. ), about 0 miles away. Mutxamel is a municipality in the comarca of Alacantí, Alicante, Valencian Community, Spain. Located at 38.414, -0.446 (Lat. / Lng. ), about 5 miles away. Alicante terminal is the central railway station of Alicante, Spain. Commonly referred locally as the RENFE station, the station is part of Adif system, and is a terminal station. The station accommodates RENFE long-distance and medium-distance trains, and it is the origin of lines C-1 and C-3 of Cercanías Murcia/Alicante. The station is not related to the narrow gauge railway Alicante-Dénia managed by FGV and part of the city's tram network. Located at 38.3444, -0.494972 (Lat. / Lng. ), about 1 miles away. Gravina Museum of Fine Arts is a museum in the city of Alicante, Spain, located in the Palacio del Conde de Lumiares, a four floor building constructed between 1748 and 1808 and declared a historical monument. The museum is devoted to painting and sculpture of Alicante from the sixteenth century to the early decades of the twentieth century. Located at 38.3456, -0.479667 (Lat. / Lng. ), about 0 miles away. 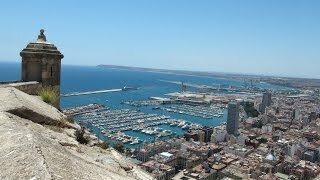 The Port of Alicante is a seaport in Alicante, Spain on the Mediterranean Sea used for commercial and passenger traffic. The port is administered by the Port Authority of Alicante. Located at 38.3369, -0.488611 (Lat. / Lng. ), about 1 miles away. The Co-cathedral of Saint Nicholas of Bari (Valencian: Cocatedral de Sant Nicolau de Bari, Spanish: Concatedral de San Nicolás de Bari) is a Roman Catholic co-cathedral located in Alacant, in the Valencian Community of Spain. The church, part of the Diocese of Orihuela-Alicante is dedicated to Saint Nicholas and was elevated to the title of cathedral on 9 March 1959 by Pope John XXIII. Located at 38.3454, -0.4825 (Lat. / Lng. ), about 0 miles away. The Basilica of Santa Maria is the oldest active church in Alicante, Spain. It was built in Gothic style between the 14th and 16th centuries over the remains of a mosque. The basilica is composed from a single nave with six side chapels located between the buttresses. In 2007, by request of the city of Alicante to the Holy See, the church was promoted to the rank of basilica. Located at 38.3462, -0.479306 (Lat. / Lng. ), about 0 miles away. Canalobre Caves are located in Busot, a small town 23 km away from the city of Alicante. The entrance to the caves is at the altitude of about 700 m on the northern slopes of the mountain ridge known as Cabezón de Oro (literally, big golden head). The caves are famous for a large vault of 70 m height similar in shape to a cathedral. Located at 38.5103, -0.411389 (Lat. / Lng. ), about 12 miles away. Alicante Museum of Contemporary Art is a municipal museum in Alicante that exhibits the 20th-century and contemporary art. Created in 1976 thanks to Eusebio Sempere, and reopened in 2011 after a major renovation, the museum now consists of three permanent collections of about 800 art pieces. The museum is located in Asegurada building, the oldest civil building remaining in the city. Located at 38.3462, -0.479694 (Lat. / Lng. ), about 0 miles away. Gran Sol (also Hotel Gran Sol, Hotel Tryp Gran Sol) is a skyscraper and hotel in Alicante, Spain. Has 97 meters and 31 floors. It's a brand hotel Tryp Hotels belonging to the hotel group Sol Melia. The hotel is the third tallest building in the city, behind Estudiotel Alicante (100 m) and the El Barco (100 m). Located at 38.3439, -0.483056 (Lat. / Lng. ), about 0 miles away. These districts belong to Alicante. These are districts that are close by, but belong to a different city than Alicante. These are some bigger and more relevant cities in the wider vivinity of Alicante.